Cold Steel's San Mai III Gurkha Kukri may be the heaviest kukri produced today -- with full tang VG-1 high carbon stainless steel construction and a thickness of 5/16 inches, that's certainly possible. 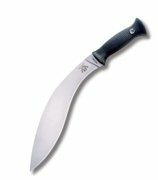 Designed by Lynn Thompson, the president of Cold Steel, the San Mai III Kukri varies only slightly in shape from the traditional Nepalese military blade. A full twelve inches of cutting edge places most of the blade's weight in the forward third of the knife for heavy chopping power. The strong point narrows slightly from the traditional design to accentuate piercing ability. With this quality of steel and a Rockwell hardness of 60-63, the Kukri is certainly a durable blade capable of stabbing through a steel drum without much wear and tear. As demonstration videos on the Cold Steel page show, the Kukri chops through bulky slabs of meat -- including rib cages -- with the ease of a samurai sword. On the advice of Dr. Maung Gyi, president of the American Bando Association, the Cold Steel San Mai III Kukri is built heavy enough for smashing as well as slashing -- strike with the back of this thick blade, and the result is like getting hit with a long thin hammer. Twenty-two ounces moving fast puts a lot of force behind that 5/16-inch thick knife. Stepping up from the polypropylene handles of Cold Steel's cheaper models, the San Mai III cushions that blow with a resilient Kraton grip. The massive knife rides at the hip in a black Secure-Ex sheath designed to hang from the belt and lash to the thigh. Built to impress and intimidate, the knife does comes with a lot of polish and good lines. Typical of Cold Steel's designs, the San Mai III isn't fancy but definitely is built to do the job. Be careful -- whatever damage you do with it is likely to be permanent.